Cell proliferation and apoptosis are both involved in arterial wall remodeling. Increase in blood flow induces arterial enlargement. The molecular basis of flow-induced remodeling in large elastic arteries is largely unknown. An aortocaval fistula (ACF) model in rats was used to induce enlargement in the abdominal aorta. Aortic gene expression of transforming growth factors beta (TGF-β) and apoptosis-related factors was assessed at 1 and 3 days and 1, 2, 4, and 8 weeks. Expression levels were determined using a ribonuclease protection assay and western blotting. Cell proliferation and apoptosis were analyzed using BrdU incorporation and TUNEL techniques. Blood flow increased 5-fold immediately after ACF (P<0.05). Lumen diameter of the aorta was 30% and 75% larger at 2 and 8 weeks respectively than those of controls (P<0.05). mRNA levels of TGF-β1 and TGF-β3 increased after ACF, peaked at 3 days (P<0.05) and returned to normal level at 1 week and thereafter. 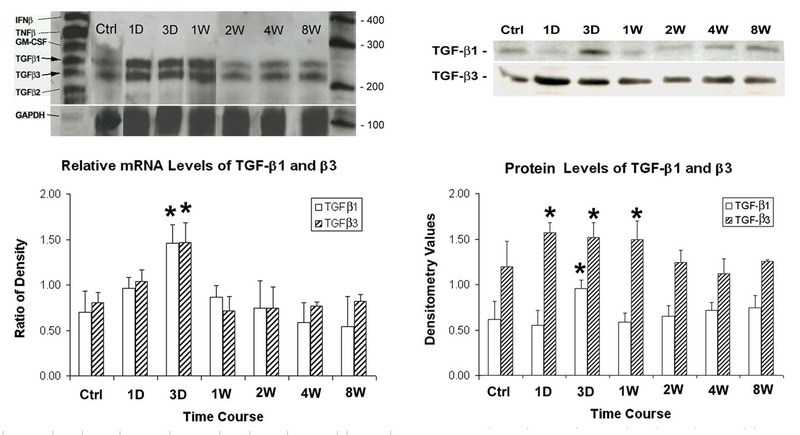 Western blotting showed enhanced expression of TGF-β1 at 3 days and TGF-β3 at 1 and 3 days and 1 week (P<0.05). mRNA levels of Bcl-xS initially decreased at 1 day, 3 days and 1 week, followed a return to baseline level at 2 weeks. Cell proliferation was observed at all time points after ACF (P<0.001 vs. controls) with proliferation in endothelial cells more significant than smooth muscle cells. Apoptosis was not significant. Gene expression of TGF-β1 and β3 precedes arterial enlargement. Expression of apoptosis related factors is little regulated in the early stage of the flow-induced arterial remodeling. The arterial wall remodels in response to hemodynamic forces imposed on it by blood pressure and blood flow. The processes of arterial remodeling involve regulation of vascular cell dynamics and control of matrix synthesis and degradation . Endothelial cell (EC) proliferation is observed in flow-induced arterial dilation  and in vessel luminal expansion in mesenteric arterial collaterals in the rat . Smooth muscle cells (SMC) have also been shown to proliferate in the vessel dilatation remodeling . In the meantime, extracellular matrix (ECM) is involved in a variety of remodeling processes [4–9] including flow-induced arterial dilation . These observations indicate that cell proliferation and ECM accumulation are critically involved in vessel remodeling. Furthermore, degenerative or destructive changes in both cellular and extracellular components of the vessel wall are also evidenced in many situations involving vessel dilatation changes. 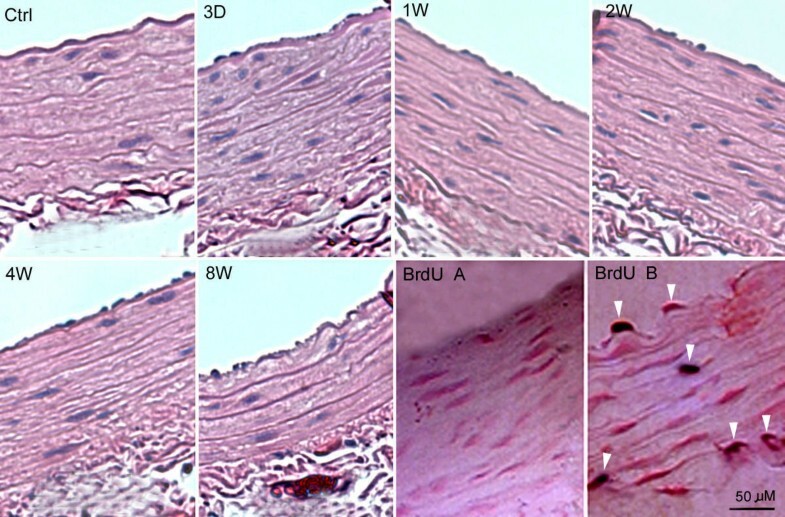 The internal elastic lamella of arteries is shown to form gaps prior to vessel dilatation in an experimental arteriovenous model in rabbit carotid artery . Collagenase and matrix metalloproteinases (MMPs) have been observed to be upregulated during vessel dilation either in flow-induced model  or in a post-stenotic dilatation . Several growth factors, in particular TGF-β, have been shown to be involved in vessel wall remodeling with respect to both cellular proliferation and ECM accumulation [12–15]. Cell apoptosis has been shown to play a role in various remodeling processes , including hypertension-induced remodeling  and subnormal shear stress induced endothelial cell apoptosis . Interestingly, TGF-β super family has been related to apoptosis in vascular cells . However, whether flow-induced arterial dilatation may also associated with apoptosis and how it might be coordinated with cell proliferation in a large elastic artery remain unclear. The present study was aimed to assess gene expression of both TGF-β and apoptosis related molecules in early response of the artery to an increase in blood flow in rat abdominal aorta. The aortocaval fistula (ACF) [18, 19] was created between the infrarenal abdominal aorta and the adjacent vena cava in male Sprague-Dawley rats weighing 250–300 g. All procedures were carried out following the guidelines set forth in the Resource Manual for the Care and Use of Animals in Research and Teaching at Stanford University. Surgical procedures were carried out with sterile technique under a surgical microscope. Rats were under general anesthesia with an intraperitoneal injection of sodium pentobarbital (50 mg/kg). Through a midline abdominal incision the infra-renal abdominal aorta and the inferior vena cava were visualized. The aortic blood flow was stopped by a microvascular clamp placed 5 mm above the iliac bifurcation. A side-to-side ACF was constructed by a needle puncture method using a 19-guage needle. The outer wall of the aorta distal to the clamp was pierced with the needle, which was then advanced into the vena cava. The needle was subsequently retrieved and the arteriotomy was closed with 8–0 silk suture. The clamp was then removed and the vena cava was evaluated for bright red color, an indication of a successful ACF. The abdominal wall was closed with silk suture. The skin was then closed with microsurgical clips. Sham operated rats underwent the same surgical procedure except that only the aortic wall was pierced and subsequently closed without ACF construction. Animals were sacrificed 1 and 3 days, 1, 2, 4, and 8 weeks after surgery (n = 3 for each time point). Equal number of sham operated and age matched animals served as controls. Two sets of animals were used. One was for extraction of total tissue RNA and protein and one for perfusion fixation for histology. Blood flow rate (mL/min) in the infra-renal aorta was measured by micro Doppler velocimetry before and immediately after ACF construction and again at the end of the experiment. Wall shear stress (WSS) was calculated using the Hagen-Poiseuille formula τW = 0.1 × 4 μQ/πr3, where τW is WSS in newtons per square meter (Pa), μ is the blood viscosity (0.03 poise), Q is blood flow rate (mL/s), and r is arterial lumen radius (centimeter) . The infra-renal aorta of 5 mm long, starting 2 mm proximal to the fistula, was harvested and immediately frozen in liquid nitrogen for extraction of total RNA and protein by using Trizol Reagent (Life Technologies, Inc. Rockville, MD). For histological study the animals were perfusion fixed through a catheter in the left ventricle of the heart with 4% paraformaldehyde at room temperature and at a pressure of 100 mmHg for 30 minutes. This was performed in an attempt to preserve the physiological architecture of the vessel wall and to prevent the vessel from collapsing as described previously . The aorta was then taken and further fixed in 4% paraformaldehyde for two more hours. The standard site for sectioning was at 4 mm proximal to the fistula orifice, which is equivalent to the middle portion of the samples for total RNA extraction. Paraffin embedded and frozen sections were prepared as needed. Relative mRNA levels were assessed using ribonuclease protection assay (RPA) to determine gene expression of growth factors and apoptosis related molecules. Non-radioactive RNA probes were transcribed from multi-probe template set for rat cytokines (rCK-3) and a set for rat apoptosis factors (rAPO-1), (Pharmingen, San Diego, CA) . An in vitro RNA transcription kit (Promega, Madison, WS) was applied with the addition of biotin-16-UTP for labeling the probes (Roche, Indianapolis, IN). The sensitivity and specificity of the probes were carefully tested before starting the experiment. Five micrograms of total RNA from each animal were hybridized with the probes and an RPA-III kit (Ambion, Austin, TX) was used for RPA following the manufacturer's protocols. The protected fragments of the probes were resolved in 5% denaturing polyacrylamide gel followed by blotting to a positively-charged nylon membrane. The resolved probes were detected using BrightStar kit (Ambion) and exposed to films. The resulted films were scanned, and densitometry was performed with NIH Image program version 1.62 (National Institutes of Health, Bethesda, MD). The relative values of protected probe fragments were expressed as a ratio of their densitometry values over those of GAPDH (glyceraldehyde- 3-phosphate dehydrogenase) in the same lane. The mean and SD were calculated for each time point. Western blotting analysis was performed for analyses of TGF-β1 and β3 as well as Bcl-xS. All procedures were published previously [6, 20]. In brief, protein samples of 25 μg in 2 × sodium dodecylsulfate loading buffer were fractionated by 10% sodium dodecylsulfate-polyacrylamide gel electrophoresis at 100 V. The proteins were transferred onto 0.45-μm pore nitrocellulose membrane (Schleicher & Schuell, Keene, NH) at 40 V for 45 to 60 minutes. The membranes were blocked with 5% nonfat milk and incubated at room temperature for 1 hour with anti-TGF-β1 polyclonal antibody at a 1:200 dilution, anti-TGF-β3 polyclonal antibody at a 1:1000 dilution, and anti Bcl-xS polyclonal antibody at 1:500 dilution. After extensive washes with phosphate buffered saline, the blots were incubated with appropriate secondary antibodies (1:1000) conjugated with horseradish peroxidase for 1 hour at room temperature. The blots were washed three times in phosphate-buffered saline, and the protein complexes were detected with enhanced chemiluminescence detection reagents according to the manufacturer's protocol (Amersham Pharmacia Biotech, Inc, Piscataway, NJ). The presented data are the results from three animals in each of the time points. Protein samples from each animal were fractionated on more than one gel, in duplicate or triplicate. Immunohistochemistry was performed on paraffin sections, 4 micron in thickness, following previous protocols . The same antibodies used for western blotting were used for detection of TGF-β1 and TGF-β3 with optimized dilutions. Sections were de-paraffinized and rehydrated in PBS, followed by incubation in 3% H2O2 in PBS for 10 minutes. After washes in PBS for 5 minutes, the sections were incubated in 1:100 diluted horse serum for 30 minutes. Sections were incubated with primary antibody at 1:50 dilution in PBS for 1 hour at room temperature. After 3 washes in PBS, the sections were incubated with the corresponding biotinylated secondary antibody (Vector Laboratories, Inc, CA) at 1:200 dilutions for 1 hour at room temperature followed by ABC-DAB method (Vector Laboratories, Inc) according to the manufacturer's protocol. The detection was brown precipitates as a result of the reaction of DAB with horse radish peroxidase. The sections were counterstained with hematoxylin and coverslipped. Incorporation and detection technique  of 5-bromo-2'-deoxy-uridine (BrdU) was used to assess DNA synthesis during cell proliferation. Three injections of BrdU (Sigma, St Louis, Mo), 50 mg/kg body weight, were administered intraperitoneally to the animals 20, 6, and 1 hours before they were humanely killed. Immunodetection of BrdU incorporation was performed on frozen sections with a detection kit (Roche). The cell type of BrdU-incorporated cells was assessed histologically. In addition, an antibody against α-actin (Enzo Diagnostics, Inc, Farmingdale, NY) was used to confirm SMCs in the media. The number of BrdU-labeled nuclei was counted from each whole cross section. The mean and SD were obtained from three animals for each time interval, and the cell proliferation rate was expressed as a number of labeled nuclei per section. Terminal deoxynucleotidyl transferase-mediated dUTP nick end-labeling (TUNEL) method was used to demonstrate apoptosis in SMCs and endothelial cells . The TUNEL was performed on frozen sections. An in situ cell death detection kit (Roche) was used for TUNEL with modifications. Nuclei of apoptotic cells were thus labeled with fluorescein, and the sections were counterstained with propidium iodide and observed under laser-scanning confocal microscope (Bio-Rad MRC 1024, Hercules, CA). Negative controls were included by omitting the labeling buffer. Positive controls were obtained by digestion of the sections with deoxyribonuclease I for 10 minutes at room temperature before the detection procedure. Labeled nuclei were counted per section. The mean and SD of each time point were obtained from three animals for statistical analysis. Cross sections from the perfusion fixed specimens were stained with H.E. and Mason's trichrome staining. The sections were digitized by tracing the contours of the lumen, the internal elastic lamella, and the external elastic lamella. The lumen diameter was calculated from the circumference of the lumen. The external diameter was calculated from the circumference of the external elastic lamella. The average wall thickness was the difference of the two diameters divided by 2. Mean and SD were calculated from 3 sections of each time point. Data were presented as mean ± SD. Single factor analysis of variance (ANOVA) and Bonferroni's test were used for multiple-comparisons. StatView software version 5.0 (SAS Institute Inc, San Francisco, CA) was used for the statistical analysis. The difference was considered significant if P < 0.05. The ACF produced an increase in blood flow and therefore WSS in the infrarenal aorta by more than 5 folds after surgery (Table 1). Morphometry revealed an increase in lumen diameters. The lumen diameter started to increase at 1 week after ACF although this change did not reach statistical significance. At 2 weeks and thereafter, the lumen diameters were significantly larger than those of controls, which were accompanied with decreased wall thickness (Figure 1 and table 1). Dimensional changes after ACV Lumen diameter and wall thickness were changed after creation of ACV as compared to non-operated control and sham-operated control, which were subjected to the operation but no ACF was created. See table 1 for detailed morphometry results. RPA using the multiple probes of rCK-3 revealed an upregulation of both TGF-β1 and TGF-β3 gene expression. The relative mRNA levels of them increased with a peak at 3 days. The levels declined after 3 days and returned to control levels (Figure 2, left panels). Western blot analysis showed an increase in the protein levels with a similar trend to mRNA levels for both TGF-β1 and β3 (Figure 2, right panels). Moreover, TGF-β3 protein levels remained high at 1 week. These changes preceded the aortic enlargement, which happened at 2 weeks. Immunohistochemistry revealed detection of both TGF-β1 and β3 after flow increased. The increased expression peaked at 1 and 3 days compared to controls. The expression of these growth factors was closely associated with immunohistochemical staining (Figure 3). The SMC in the inner and outer zones of the media seemed to be more involved in the expression of these growth factors. RPA and western blot for TGF-β Left panels, top: A representative film resulted from an RPA procedure showing the major bands, which correspond to TGF-β1 at the 256 base level and TGF-β3 at 226 base level as well as GAPDG at 97 base level according to the manufacturer's design. The far left lane shows the multiple probes without RNase digestion. The far right lane shows molecular markers. Bottom: Relative mRNA levels of TGF-β1 and β3. Data are expressed as density ratio of TGF-beta over GAPDH from three separate experiments. Both TGF-β1 and TGF-β3 were highly expressed with a peak at 3 day for each. The mRNA levels were declined after 3 days and returned to control levels. * P < 0.05 compared to controls (Ctrl). Right panels, top: Representative bands of Western blot analysis for TGF-β1 and TGF-β3. Bottom: Densitometry values show similar trend to mRNA levels for both TGF-β1 and β3. * P < 0.05 compared to controls (Ctrl). Data are means from three separate experiments. D, Day; GAPDH, glyceraldehyde-3-phosphate dehydrogenase; W, week. Immunohistochemical staining for TGF-β Immunohistochemical staining of TGF-β1 (A to D) and β3 (E to H). The brown color indicates the detection. There was a slight detection of both TGF-β1 and β3 in controls (A, E). The peak staining was at 3 days after ACF for TGF-β1 (B, C) and at 3 days and 1 week for β3 (F, G). SMC showed stronger staining. Furthermore, SMC in the inner and outer zones of the media seemed to be more involved. Panels D and H are negative controls (NC), in which corresponding primary antibodies were omitted. RPA with the multiple-probe of rAPO-1 showed that relative mRNA levels of Bcl-x short isoform (Bcl-xS), known as pro-apoptotic factors, initially decreased at 1 day, 3 days and 1 week followed by returning to base line level after 2W (Figure 4). There was an increase in caspase-3 and Bax mRNA levels at 4W. Other factors did not show significant changes. Western blotting analysis showed a similar trend of mRNA level for Bcl-xS (Figure 4), but statistical outcome did not reach significance. Immunohistochemistry did not show any apparent detection of these molecules. RPA results of apoptosis-related factors A representative of RPA results is shown in panel A with multiple probes of apoptosis related cytokines. The RPA showed that relative mRNA levels of Bcl-xS were initially decreased at 1 day, 3 days and 1 week followed by returning to base line level after 2W (B). There was an increase in caspase-3 and Bax mRNA levels at 4w. Data are expressed as density ratio of TGF-beta over GAPDH from three separate experiments. Western blotting analysis showed a similar trend (C) to the mRNA levels for Bcl-xS but statistical analysis did not reach significance. * P < 0.001 compared to controls. Cell proliferation was remarkable for both EC and SMC with EC more significant than SMC (Figure 5). BrdU incorporated nuclei were observed in the media, along the endothelial line and in the adventitia. The incorporation rate for endothelial cells increased at 1 week and thereafter (P < 0.05 vs. controls) and the incorporation rate of SMC increased at 4 weeks (P < 0.05 vs. controls) (Table 1). Cell proliferation The number of Both EC and SMC increased at all time points after ACF as compared to controls as shown in the representative panels Ctrl to 8W (HE staining). In panels BrdU A and B, BrdU incorporated nuclei were stained dark blue and all other nuclei were counter stained pink by fast red. There was no detection in sham control (BrdU A). However, the detection (indicated by white arrowheads) was significantly higher at 1 week (BrdU B). Apoptosis of vascular cells was assessed by TUNEL method in all animals. There was no remarkable difference in apoptosis rate after ACF creation (data not shown). 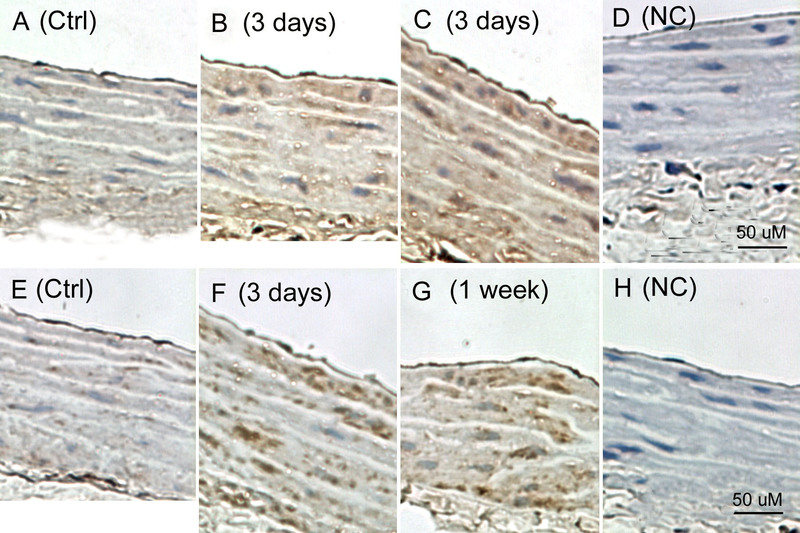 Vascular wall remodeling in response to hemodynamic alterations has been known closely related to lesion development in the arterial wall [21–23]. Arterial wall shear stress is proven to be a critical factor in regulation of vessel diameter. Increase in blood flow, or shear stress, induces enlargement of the artery [2, 24–26]; and decrease in shear stress results in reduction of lumen diameter of the artery [26–28]. The present study once again demonstrated that increased blood flow rate induced arterial enlargement in an aortocaval fistula model in rats. More significantly, this model subjects the abdominal aortic aorta to a condition of an acute increase in blood flow. So far, most of vessel remodeling studies are based on peripheral arteries, such as carotid and iliac arteries. There are very few models using larger and elastic arteries like aorta for study of flow-induced response . The current model provides a direct access to the investigation of abdominal aorta with blood flow-induced hemodynamic alteration. The study showed that the adaptive enlargement was associated with increased gene expression of TGF-β1 and β3, known as tissue remodeling mediators [12, 17, 29]. Gene expression of TGF-β1 and β3 was upregulated at 1 and 3 days and 1 week upon increase in blood flow, while the flow-induced aortic enlargement occurred 2 weeks after ACF creation. Furthermore, the expression of these growth factors mainly associated with endothelial cells and smooth muscle cells in the inner media. These results suggest that the function of TGF-β superfamily may be a prerequisite for the arterial dilatation and that endothelial cells and the smooth muscle cells may be responsible for the forth-going vessel enlargement. TGF-β expression is closely associated with an increase in wall shear stress [30, 31] and with different forms of fluid shear stress , and its function is modulated by variety of factors . For example, TGF-β1 is secreted in an inactive precursor and requires furin-mediated maturation . TGF-β1 in turn induces expression of furin. It has been demonstrated that both furin and TGF-β gene expression was upregulated by fluid shear stress in vascular endothelial cells. Thus, the positive feedback may enhance the effect of TGF-β1 on endothelial cells and vascular smooth muscle cells as demonstrated by Negishi et al. . The present study demonstrated that fluid shear stress induced regulation of TGF-β expression in the larger elastic artery. Furthermore, TGF-β upregulation was associated with cell proliferation, which was significant at almost all time points, with EC more remarkable than SMC. TGF-β superfamily of growth factors is powerful and subtle regulation of its expression may exert a remarkable action. TGF-β is a potent regulator of the cell cycle in many cell types including vascular smooth muscle and endothelial cells, and as a result this growth factor has been postulated to play an important, though largely undefined, role in vascular proliferative processes . So far, little is known about the modulation role of TGF-β3 in vessel remodeling. It is known that TGF-β3 plays a role in cardiac morphogenesis, mammary gland development and wound healing and that TGF-β3 is involved in fine-tuned interactions between epithelial and mesenchymal cells and their products . The exact role of TGF-β3 in vascular remodeling response remains unclear. It is conceivable that after an acute regulation of cell proliferation and ECM degradation, TGF-β3 may exert a fine tune up between cells and ECM for a reconstruction of the remodeled wall. The mechanical and biochemical mechanisms of flow or shear-regulated arterial dilatation and the vessel remodeling have been widely studied . Vessel wall shear stress exerted by blood flow is a regulating mechanical force on endothelial cells that has important physiological and pathological cardiovascular consequences. The endothelial monolayer in vivo acts as a signal transduction interface for mechanical forces, in particular, shear stress. Mechanisms related to spatial relationships at the cell surfaces and throughout the cells in the wall that influence flow-mediated endothelial mechanotransduction involve many cytokines including TGF-β superfamily. Furthermore, flow-mediated ion channel activation and cytoskeletal dynamics are related to topographic characteristics of the luminal and abluminal surfaces of living endothelial cells . Arterial dilatation is thought to be endothelial dependent [26, 36]. Endothelial proliferation during the flow-induced arterial enlargement has been shown to be a characteristic event . The vessel enlargement results in an increase in lumen surface area while endothelial cell proliferation assures a continuous cell lining throughout. Our observation indicated that apoptosis was not remarkable in the early stage of flow-induced dilatation; although apoptosis has been implicated to play a role in vessel remodeling . There was little change in TUNNEL analysis after ACF creation. However, some apoptosis-related factors were regulated. For example, the mRNA levels of Bcl-xS were initially decreased at 1 day, 3 days and 1 week followed by returning to base line level after 2 weeks. 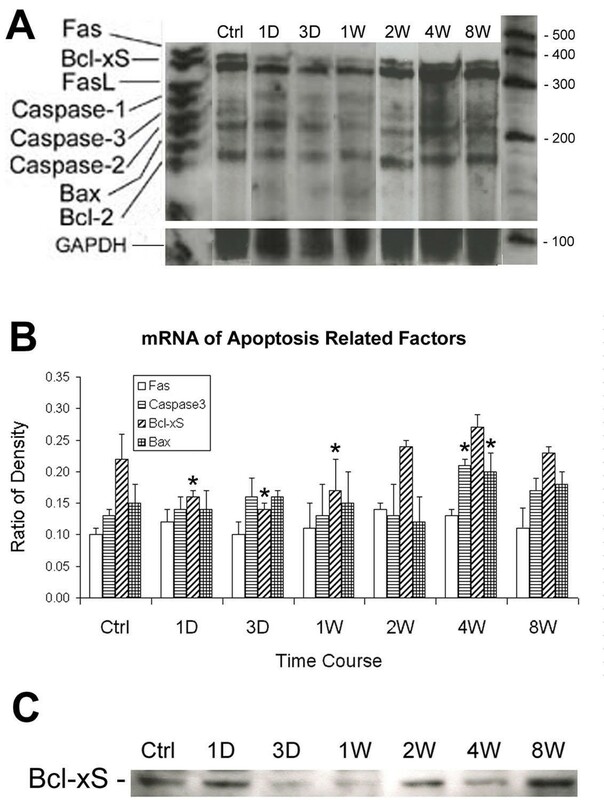 There was an increase in caspase-3 and Bax mRNA levels at 4 weeks. Follow up western blotting analysis was unable to determine the expression trends, suggesting that cell apoptosis regulation in vivo may be too subtle to be detected. Apoptosis related molecules, such as Bcl-xS, Bax, and casepase-3, are known to be proapoptotic factors and involved in variety of vessel remodeling processes [37–39]. The initial arrest in Bcl-xS gene expression may momentarily depress apoptosis. It is conceivable that during the early stage of the remodeling, cell proliferation is the dominant response and apoptosis may be somewhat repressed to favor cell survival. This is contested by the little changes in TUNEL detection. In summary, the experiments demonstrate that gene expression of TGF-β1 and β3 precedes the flow induced arterial enlargement and is associated with cell proliferation. Expression of apoptosis-related molecules, such as Bcl-xS, Bax, and caspase-3, seems to be little regulated in the early stage of this vessel remodeling process. This work was supported by grants from the Morris & Alvirda Hyman Aneurysm Research Program (CX, SL, CKZ), NIH HL-64327 (CKZ, CX), and the Japanese Ministry of Education, Culture, Sports and Science (Kaken-hi), #14570176 (HM). CS was supported by a grant of exchanging scholar program. CX designed the experiment, directed all studies, performed statistical analysis, and drafted the manuscript. SL carried out ACF procedures, performed RPA and cell proliferation and apoptosis analyses. CS participated in the molecular analyses and performed western blotting. HM participated in the design of the study and offered help in histological study. CKZ conceived of the study, directed and oversaw the project, participated in its design, and reviewed the manuscript.